My glazed item looks stained. What can I do? Due to the nature of reactive glaze, this item has the potential to stain. For best results, soak in water and bleach to help remove discoloration. 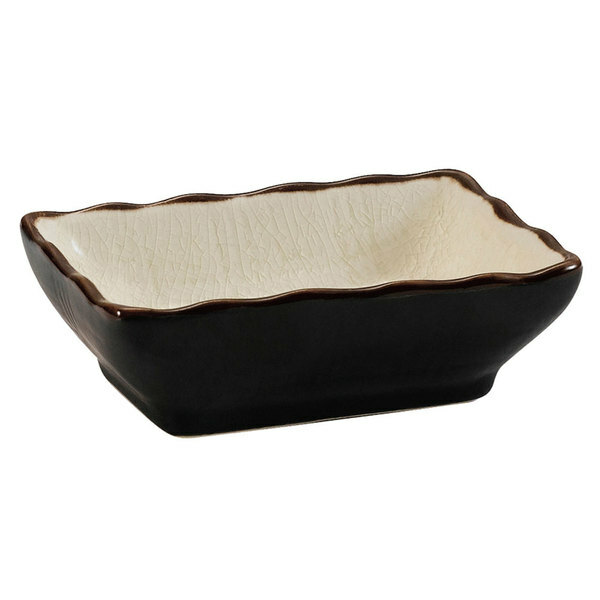 This CAC 666-32-W black non-glare glaze and creamy white Japanese style 3 1/4" x 2 1/2" sauce dish is perfect for presenting sauces such as soy, teriyaki, duck, and wasabi. Its tapered rectangular shape makes it easy to dip sushi or vegetables. This Japanese style 3 1/4" x 2 1/2" sauce dish features a wavy rim surface and sculpted vertical lines as embellishments.